When Land Rover chose to build the small but mighty Evoque model of the Range Rover they aimed to prove you don’t need a massive vehicle to have one that has the luxury you need. This small size allows the Evoque to come to you in a relatively affordable price and give you the ride you want to enjoy on the road. This is a fantastic SUV to enjoy on the city streets in your area while carrying the Land Rover badge that makes it one of the most impressive vehicles on the road. If you crave more style than what a typical Range Rover offers, the Evoque is a model that gives you what you want. This is a small but impressive SUV that offers you a moderate cargo area and the price you want. 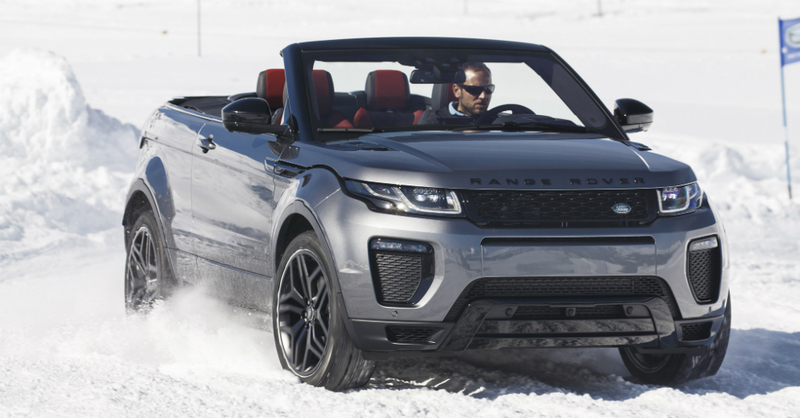 You can enjoy the Evoque as a gorgeous coupe SUV that gives you a sportier look or even the fun of the top down feeling in the convertible version of the Evoque. This is an SUV that provides you with the right way to show off your high class personality to the world when you’re driving. Speaking of the convertible model, this is a new addition for 2017 that brings in the top that can open and close in eighteen seconds while the vehicle is in motion at speeds of up to 30 mph. This is a great way to make an entrance or an exit when you arrive or depart from an event in your Evoque model of the Range Rover. You’ll enjoy the ride of this amazing SUV whenever you choose to take it around town and let it be seen by those who don’t get to see a Range Rover as often as you get to drive one. Regardless of the Range Rover Evoque model you choose you’re only going to enjoy one engine under the hood. That engine is a 2.0-liter turbocharged four-cylinder engine that provides you with 240 horsepower and 251 lb.-ft. of torque. This engine is attached to a beautiful nine-speed automatic transmission to give you the power delivery and performance you want. This vehicle shows up with full time AWD and brings you 21 city/29 hwy in the coupe or 20 city/28 hwy mpg in the convertible to have the fuel efficiency you want in a vehicle that’s easy to love on the road. When you see the name Land Rover Range Rover on the title it doesn’t matter the size of the vehicle you expect to have plenty of impressive features to be present. The Evoque comes standard with the Active Driveline AWD, the Land Rover Terrain Response system with six modes (General, Grass, Gravel, Snow, Mud and Ruts, and Sand), the All-terrain Progress Control system to help maintain low speed below 19 mph when crawling along on the trails, an InControl Touch infotainment system and a variety of great comfort and convenience features along with the driving aids you want. Looking toward the options offered for the Evoque you’ll find the list includes items such as a navigations system, the InControl Pro Services, leather upholstery, 19-inch wheels, Adaptive Dynamics, Oxford leather on the steering wheel, 14-way power seats that are covered in Oxford leather, the InControl Touch Plus, a 17-speaker surround sound system, adaptive headlights with the Land Rover LED signature, satin brushed aluminum trim and much more. The features you get to enjoy are based upon the trim level you choose along the way and give you more comfort and convenience items as you climb the trim ladder. Look to the Land Rover Range Rover Evoque if you want a fantastic small SUV that will offer you the ride and quality you want to enjoy on any road or trail in your area. This is a dynamic vehicle that can make a huge entrance or exit with the convertible top but it can also navigate the toughest trails you can find to give you a great way to get where you want to go. It’s time for you to drive a high quality SUV that offers you what you want to enjoy, come in and check out the Evoque at your local Land Rover dealer today. The Stinger; What Do We Know?